In considering the relationship between manufactured structures and the natural environment along the Missouri River, Lori Elliott-Bartle, Marcia Joffe-Bouska, and Tom Quest's collaborative work is amplified by the rich textures and diverse material palette of their individual work in "Rivers". 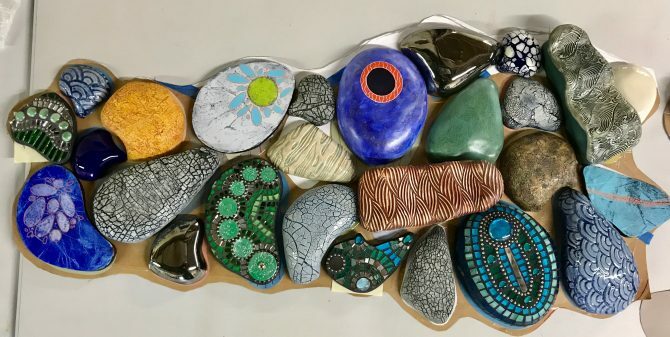 While contemplating place, memory, and connection to nature, these local artists began their first collaborative work in 2015 titled "Rivers, Roads, Remains." This large work uses maps from the Omaha Public Library's collection, the design from the Bob Kerrey Pedestrian Bridge as well as the Missouri River as content generators. For their exhibition at the Michael Phipps Gallery, they have spent the last year taking the initial ideas and work in "Rivers, Roads, Remains", and creating a new undulating work titled "River". As a new iteration on the theme, each artist's hand plays in a role in shaping this work. Elliott-Bartle's expressionist painting flows past Joffe-Bouska's glass tiles and found objects, while Quest's ceramic work adds naturalistic texture all in various forms and in multiple moments. Learn more about the artists Lori Elliott-Bartle, Marcia Joffe-Bouska, and Tom Quest.